I’ve spent much of the last month preparing a major research proposal for the Ontario Research Fund (ORF), entitled “Integrated Decision Support for Sustainable Communities”. We’ve assembled a great research team, with professors from a number of different departments, across the schools of engineering, information, architecture, and arts and science. We’ve held meetings with a number of industrial companies involved in software for data analytics and 3D modeling, consultancy companies involved in urban planning and design, and people from both provincial and city government. We started putting this together in September, and were working to a proposal deadline at the end of January. The work being done by researchers in this province is recognized and valued. This announcement is not a reflection of the government’s continued commitment through other programs that provides support to the important work being done by researchers. Our goal is to establish Ontario as a world leader in building sustainable communities, through the use of data analytics tools that provide decision-makers with a more complete understanding of how cities work. We will bring together existing expertise in data integration, systems analysis, modeling, and visualization to address the information needs of citizens and policy-makers who must come together to re-invent towns and cities as the basis for a liveable, resilient, carbon-neutral society. The program integrates the work of a team of world-class researchers, and builds on the advantages Ontario enjoys as an early adopter of smart grid technologies and open data initiatives. The long-term sustainability of Ontario’s quality of life and economic prosperity depends on our ability to adopt new, transformative approaches to urban design and energy management. The transition to clean energy and the renewal of urban infrastructure must go hand-in-hand, to deliver improvements across a wide range of indicators, including design quality, innovation, lifestyle, transportation, energy efficiency and social justice. Design, planning and decision-making must incorporate a systems-of-systems view, to encompass the many processes that shape modern cities, and the complex interactions between them. Data Integration and Management: We will identify access paths to the data sources needed to drive our simulations and visualizations, and incorporate techniques for managing and combining very large datasets. These themes combine to provide an integrated approach to intelligent, data-driven planning and decision-making. We will apply the technologies we develop in a series of community-based design case studies, chosen to demonstrate how our approach would apply to increasingly complex problems such as energy efficiency, urban intensification, and transportation. Our goal is to show how an integrated approach can improve the quality and openness of the decision-making process, while taking into account the needs of diverse stakeholders, and the inter-dependencies between policy, governance, finance and sustainability in city planning. Because urban regions throughout the world face many of the same challenges, this research will allow Ontario to develop a technological advantage in areas such as energy management and urban change, and enabling a new set of creative knowledge-based services address the needs of communities and governments. Ontario is well placed to develop this as a competitive advantage, due to its leadership in the collection and maintenance of large datasets in areas such as energy management, social well-being, and urban infrastructure. We will leverage this investment and create a world-class capability not available in any other jurisdiction. Incidentally, we spent much of last fall preparing a similar proposal for the previous funding round. That was rejected on the basis that we weren’t clear enough what the project outcomes would be, and what the pathways to commercialization were. For our second crack at it, we were planning to focus much more specifically on the model integration part, by developing a software framework for coupling urban system models, based on a detailed requirements analysis of the stakeholders involved in urban design and planning, with case studies on neighbourhood re-design and building energy retro-fits. Our industrial partners have identified a number of routes to commercial services that would make use of such software. Everything was coming together beautifully. *Sigh*. Now we have to find some other source of funding for this. Contributions welcome! Kaitlin Alexander is with us for the summer on a Centre for Global Change Science (CGCS) undergraduate internship. She’s doing her undergrad at the University of Manitoba in applied math, and is well know to many of us already through her blog, ClimateSight. Kaitlin will be studying the software architecture of climate models, and she’s already written a few blog posts about her progress. Trista Mueller is working in the lab for the summer as a part-time undergrad intern – she’s a computer science major at U of T, and a regular volunteer at Hot Yam. Trista is developing a number of case studies for our Inflo open calculator, and helping to shake out a few bugs in the process. Elizabeth Patitsas joins us from UBC, where she just graduated with a BSc honours degree in Integrated Science – she’s working as a research assistant over the summer and will be enrolling in grad school here in September. Elizabeth has been studying how we teach (or fail to teach) key computer science skills, both to computer science students, and to other groups, such as physical scientists. Over the summer, she’ll be developing a research project to identify which CS skills are most needed by scientists, with the eventual goal of building and evaluating a curriculum based on her findings. Fabio da Silva is a professor of computer science at the Federal University of Pernambuco (UFPE) in Brazil, and is joining us this month for a one year sabbatical. Fabio works in empirical software engineering and will be exploring how software teams coordinate their work, in particular the role of self-organizing teams. Software is a critical enabling technology in nearly all aspects of climate change, from the computational models used by climate scientists to improve our understanding of the impact of human activities on earth systems, through to the information and control systems needed to build an effective carbon-neutral society. Accordingly, we, as software researchers and software practitioners, have a major role to play in responding to the climate crisis. In this paper we map out the space in which our contributions are likely to be needed, and suggest a possible research agenda. Climate change is likely to be the deﬁning issue of the 21st century. The science is unequivocal – concentrations of greenhouse gases are rising faster than at any previous era in the earth’s history, and the impacts are already evident . Future impacts are likely to include a reduction of global food and water supplies, more frequent extreme weather events, sea level rise, ocean acidification, and mass extinctions . In the next few decades, serious impacts are expected on human health from heat stress and vector-borne diseases . Unfortunately, the scale of the systems involved makes the problem hard to understand, and hard to solve. For example, the additional carbon in greenhouse gases tends to remain in atmosphere-ocean circulation for centuries, which means past emissions commit us to further warming throughout this century, even if new emissions are dramatically reduced . The human response is also very slow – it will take decades to complete a worldwide switch to carbon-neutral energy sources, during which time atmospheric concentrations of greenhouse gases will continue to rise. These lags in the system mean that further warming is inevitable, and catastrophic climate disruption is likely on the business-as-usual scenario. Hence, we face a triple challenge: mitigation to avoid the worst climate change eﬀects by rapidly transitioning the world to a low-carbon economy; adaptation to re-engineer the infrastructure of modern society so that we can survive and ﬂourish on a hotter planet; and education to improve public understanding of the inter-relationships of the planetary climate system and human activity systems, and of the scale and urgency of the problem. These challenges are global in nature, and pervade all aspects of society. To address them, researchers, engineers, policymakers, and educators from many diﬀerent disciplines need to come to the table and ask what they can contribute. In the short term, we need to deploy, as rapidly as possible, existing technology to produce renewable energy and design government policies and international treaties to bring greenhouse gas emissions under control. In the longer term, we need to complete the transition to a global carbon-neutral society by the latter half of this century . Meeting these challenges will demand the mobilization of entire communities of expertise. Software plays a ma jor role, both as part of the problem and as part of the solution. A large part of the massive growth of energy consumption in the past few decades is due to the manufacture and use of computing and communication technologies, and the technological advances they make possible. Energy eﬃciency has never been a key requirement in the development of software-intensive technologies, and so there is a very large potential for eﬃciency improvements . But software also provides the critical infrastructure that supports the scientiﬁc study of climate change, and the use of that science by society. Software allows us to process vast amounts of geoscientiﬁc data, to simulate earth system processes, to assess the implications, and to explore possible policy responses. Software models allow scientists, activists and policymakers to share data, explore scenarios, and validate assumptions. The extent of this infrastructure is often invisible, both to those who rely on it, and to the general public . Yet weaknesses in this software (whether real or imaginary) will impede our ability to make progress in tackling climate change. We need to solve hard problems to improve the way that society ﬁnds, assesses, and uses knowledge to support collective decision-making. In this paper, we explore the role of the software community in addressing these challenges, and the potential for software infrastructure to bridge the gaps between scientific disciplines, policymakers, the media, and public opinion. We also identify critical weaknesses in our ability to develop and validate this software infrastructure, particularly as traditional software engineering methods are poorly adapted to the construction of such a vast, evolving knowledge-intensive software infrastructure. Oh, and many thanks to everyone who read drafts of this and sent me comments! I’ve speculated before about the factors that determine the length of the release cycle for climate models. The IPCC assessment process, which operates on a 5-year cycle tends to dominate everything. But there are clearly other rhythms that matter too. I had speculated that the 6-year gap between the release of CCSM3 and CCSM4 could largely be explained by the demands of the the IPCC cycle; however the NCAR folks might have blown holes in that idea by making three new releases in the last six months; clearly other temporal cycles are at play. institutional rhythms, such as the academic calendar, funding deadlines, the timing of conferences and paper deadlines, etc. biographical rhythms, arising from individual needs – family time, career development milestones, illnesses and vacations, etc. infrastructural rhythms, arising from the development of the buildings and equipment that scientific research depends on. Examples include the launch, operation and expected life of a scientific instrument on a satellite, the timing of software releases, and the development of classification systems and standards. The paper gives two interesting examples of problems in aligning these rhythms. First, the example of the study of long term phenomena such as river flow on short term research grants led to mistakes where a data collected during an unusually wet period in the early 20th century led to serious deficiencies in water management plans for the Colorado river. Second, for NASA’s Mars mission MER, the decision was taken to put the support team on “Mars time” as the Martian day is 2.7% longer than the earth day. But as the team’s daily work cycle drifted from the normal earth day, serious tensions arose between the family and social needs of the project team and the demands of the project rhythm. Here’s another example that fascinated me when I was at the NASA software verification lab in the 90s. The Cassini spacecraft took about six years to get to Saturn. Rather than develop all the mission software prior to launch, NASA took the decision to develop only the minimal software needed for launch and navigation, and delayed the start of development of the mission software until just prior to arrival at Saturn. The rational was that they didn’t want a six year gap between development and use of this software, during which time the software teams might disperse – they needed the teams in place, with recent familiarity with the code, at the point the main science missions started. For climate science, the IPCC process is clearly a major institutional rhythm, but the infrastructural rhythms that arise in model development interact with this in complex ways. I need to spend time looking at the other rhythms as well. We don’t have anywhere near enough detailed case studies in software engineering – most claims for the effectiveness of various approaches to software development are based on little more than marketing claims and anecdotal evidence. There has been a push in the last decade or so for laboratory experiments, which are usually conducted along the lines of experiments in psychology: recruit a set of subjects, assign them a programming task, and measure the difference in variables like productivity or software quality when half of them are given some new tool or technique. While these experiments are sometimes useful for insights into how individual programmers work on small tasks, they really don’t tell us much about software development in the wild, where, as Parnas puts it, the interesting challenges are in multi-person development of multi-version software over long time scales. Jorge cites a particular example in his thesis of a controlled study of pair programming, which purports to show that pair programming lowers productivity. Except that it shows no such thing – any claimed benefits of pair programming are unlikely to emerge with subjects who are put together for a single day, but who otherwise have no connection with one another, and no shared context (like, for example, a project they are both committed to). 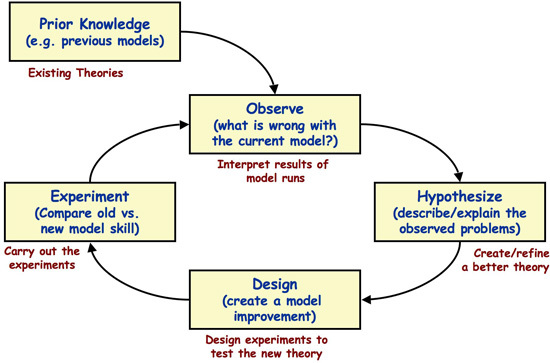 The process view, in which software construction is treated like a production line, and the details of the individuals and teams who do the construction are abstracted away, allowing researchers to talk about processes and process models, which, it is assumed, can be applied in any organizational context to achieve a predictable result. This view is predominant in the SE literature. The problem, of course, is that the experience and skills of individuals and teams do matter, and the focus on processes is a poor way to understand how software development works. The information flow view, in which much of software development is seen as a problem in sharing information across software teams. This view has become popular recently, as it enables the study of electronic repositories of team communications as evidence of interaction patterns across the team, and leads to a set of theories abut how well patterns of communication acts match the technical dependencies in the software. The view is appealing because it connects well with what we know about interdependencies within the software, where clean interfaces and information hiding are important. Jorge argues that the problem with this view is that it fails to distinguish between successful and unsuccessful acts of communication. It assumes that communication is all about transmitting and receiving information, and it ignores problems in reconstructing the meaning of a message, which is particularly hard when the recipient is in a remote location, or is reading it months or years later. The third view is that software development is largely about the development of a shared understanding within teams. This view is attractive because it takes seriously the intensive cognitive effort of software construction, and emphasizes the role of coordination, and the way that different forms of communication can impact coordination. It should be no surprise that Jorge and I both prefer this view. Then comes the most interesting part. Jorge points out that software teams need to develop a shared understanding of goals, plans, status and context, and that four factors will strongly impact their success in this: proximity (how close the team members are to each other – being in the same room is much more useful than being in different cities), synchrony (talking to each other in (near) realtime is much more useful than writing documents to be read at some later time); symmetry (which means the coordination and information sharing is done best by the people whom it most concerns, rather than imposed by, say, managers) and maturity (it really helps if a team has an established set of working relationships and a shared culture). 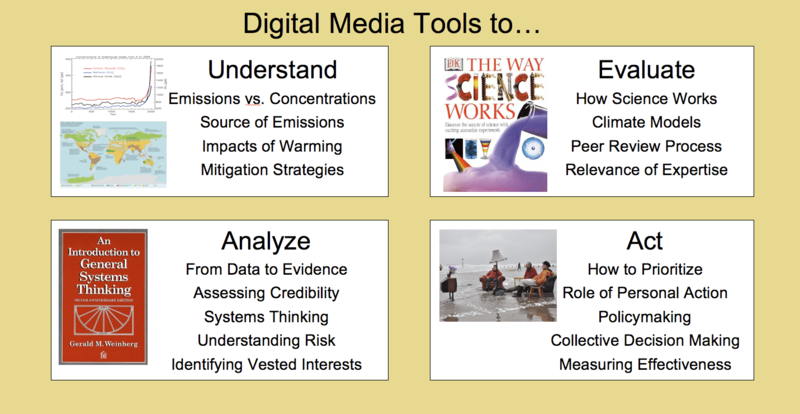 What do we want Climate Informatics Tools to do? The difference between emissions and concentrations. 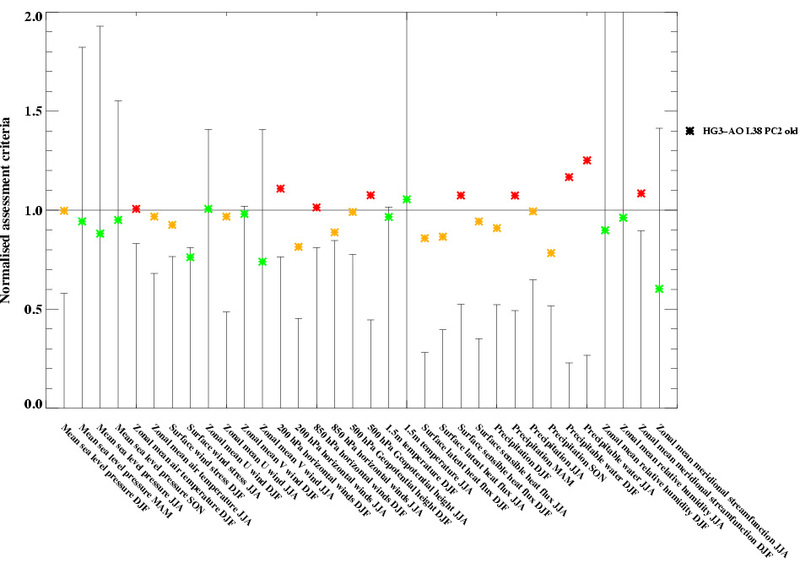 The various sources of emissions and how we know about them from detection/attribution studies. The impacts of global warming on your part of the world – health, food and water, extreme weather events, etc. The various mitigation strategies we have available, and what we know about the cost and effectiveness of each. How science works, as a process of discovery, including how scientists develop theories, and how they correct mistakes. What climate models are and how they are used to improve our understanding of climate processes. How the peer-review process works, and why it is important, both as a filter for poor research, and a way of assessing the credentials of scientists. What it means to be expert in a particular field, why expertise matters, and why expertise in one area of science doesn’t necessarily mean expertise in another. The importance of linking claims to sources of evidence, and the use of multiple sources of evidence to test a claim. How to assess the credibility of a particular claim, and the credibility of its source (desperately needed for appropriate filtering of ‘found’ information on the internet). Systems Thinking – because reductionist approaches won’t help. People need to be able to recognize and understand whole systems and the dynamics of systems-of-systems. Understanding risk – because the inability to assess risk factors is a major barrier to effective action. Identifying the operation of vested interests. Because much of the public discourse isn’t about science or politics. It’s about people with vested interests attempting to protect those interests, often at the expense of the rest of society. How to prioritize between short-term and long term goals. How to identify which kinds of personal action are important and effective. How to improve the quality of policy-making, so that policy choices are linked to the scientific evidence. How to support consensus building and democratic action for collective decision making, at the level of communities, cities, nationals, and globally. Tools to monitor effectiveness of policies and practices once they are implemented. How to calculate if you should print something out or read it on the screen. Since he first did these calculations, we’ve been discussing how you turn this kind of analysis into an open, shared, visual representation, that others can poke and prod, to test the assumptions, customize them to their own context, and discuss. We’ll share more of our design ideas for such a tool in due course. As Jorge points out, this almost completes my set of grad student bloggers. We’ve been experimenting with blogging as a way of structuring research – a kind of open notebook science. Personally, I find it extremely helpful as a way of forcing me to write down ideas (rather than just thinking them), and for furthering discussion of ideas through the comments. And, just as importantly, it’s a way of letting other researchers know about what you’re working on – grad students’ future careers depend on them making a name for themselves in their chosen research community. Of course, there’s a downside: grad students tend to worry about being “scooped”, by having someone else take their ideas, do the studies, and publish them first. My stock response is something along the lines of “research is 99% perspiration and 1% inspiration” – the ideas themselves, while important, are only a tiny part of doing research. It’s the investigation of the background literature and the implementation (design an empirical study, build a tool, develop a new theory, …etc) that matters. Give the same idea to a bunch of different grad students, and they will all do very different things with it, all of which (if the students are any good) ought to be publishable. On balance, I think the benefits of blogging your way through grad school vastly outweigh the risks. Now if only my students updated their blogs more regularly… (hint, hint). When I was visiting MPI-M earlier this month, I blogged about the difficulty of documenting climate models. The problem is particularly pertinent to questions of model validity and reproducibility, because the code itself is the result of a series of methodological choices by the climate scientists, which are entrenched in their design choices, and eventually become inscrutable. And when the code gets old, we lose access to these decisions. I suggested we need a kind of literate programming, which sprinkles the code among the relevant human representations (typically bits of physics, formulas, numerical algorithms, published papers), so that the emphasis is on explaining what the code does, rather than preparing it for a compiler to digest. The problem with literate programming (at least in the way it was conceived) is that it requires programmers to give up using the program code as their organising principle, and maybe to give up traditional programming languages altogether. But there’s a much simpler way to achieve the same effect. It’s to provide an organising structure for existing programming languages and tools, but which mixes in non-code objects in an intuitive way. Imagine you had an infinitely large sheet of paper, and could zoom in and out, and scroll in any direction. Your chunks of code are laid out on the paper, in an spatial arrangement that means something to you, such that the layout helps you navigate. Bits of documentation, published papers, design notes, data files, parameterization schemes, etc can be placed on the sheet, near to the code that they are relevant to. When you zoom in on a chunk of code, the sheet becomes a code editor; when you zoom in on a set of math formulae, it becomes a LaTeX editor, and when you zoom in on a document it becomes a word processor. Well, Code Canvas, a tool under development in Rob Deline‘s group at Microsoft Research does most of this already. The code is laid out as though it was one big UML diagram, but as you zoom in you move fluidly into a code editor. The whole thing appeals to me because I’m a spatial thinker. Traditional IDEs drive me crazy, because they separate the navigation views from the code, and force me to jump from one pane to another to navigate. In the process, they hide the inherent structure of a large code base, and constrain me to see only a small chunk at a time. Which means these tools create an artificial separation between higher level views (e.g. UML diagrams) and the code itself, sidelining the diagrammatic representations. I really like the idea of moving seamlessly back and forth between the big picture views and actual chunks of code. Code Canvas is still an early prototype, and doesn’t yet have the ability to mix in other forms of documentation (e.g. LaTeX) on the sheet (or at least not in any demo Microsoft are willing to show off), but the potential is there. I’d like to explore how we take an idea like this an customize it for scientific code development, where there is less of a strict separation of code and data than in other forms of programming, and where the link to published papers and draft reports is important. The infinitely zoomable paper could provide an intuitive unifying tool to bring all these different types of object together in one place, to be managed as a set. And the use of spatial memory to help navigate will be helpful, when the set of things gets big. I’m also interested in exploring the idea of using this metaphor for activities that don’t involve coding – for example complex decision-support for sustainability, where you need to move between spreadsheets, graphs & charts, models runs, and so on. I would lay out the basic decision task as a graph on the sheet, with sources of evidence connecting into the decision steps where they are needed. The sources of evidence could be text, graphs, spreadsheet models, live datafeeds, etc. And as you zoom in over each type of object, the sheet turns into the appropriate editor. As you zoom out, you get to see how the sources of evidence contribute to the decision-making task. Hmmm. Need a name for this idea. How about DecisionCanvas? …Anyway, along comes Joe Smagorinsky from Princeton, to give a talk on the challenges of modeling the atmosphere as a three-dimensional fluid flow problem on a rotating sphere, and Schneider is immediately fascinated by both the mathematical challenges and the potential of this as important and useful research. He goes on to talk about the early modeling work and the mis-steps made in the early 1970’s on figuring out whether the global cooling from aerosols would be stronger than the global warming from greenhouse gases, and getting the relative magnitudes wrong by running the model without including the stratosphere. And how global warming denialists today like to repeat the line about “first you predicted global cooling, then you predicted global warming…” without understanding that this is exactly how science proceeds, by trying stuff, making mistakes, and learning from them. Or as Ms. Frizzle would say, “Take chances! Make Mistakes! Get Messy!” (No, Schneider doesn’t mention Magic School Bus in the book. He’s too old for that). Anyway, I didn’t get much further reading the chapter, because my brain decided to have fun with the evocative phrase “modeling the atmosphere as a three-dimensional fluid flow problem on a rotating sphere”, which is perhaps the most succinct description I’ve heard yet of what a climate model is. And what would happen if Ms. Frizzle got hold of this model and encouraged her kids to “get messy” with it. What would they do? Let’s assume the kids can run the model, and play around with its settings. Let’s assume that they have some wonderfully evocative ways of viewing the outputs too, such as these incredible animations of precipitation from a model (my favourite is “August“) from NCAR, and where greenhouse gases go after we emit them (okay, the latter was real data, rather than a model, but you get the idea). Remove the land-masses. What happens to the gulf stream? Remove all CO2 from the atmosphere. How much colder is the earth? Why? What happens if you leave it running? Erupt a whole bunch of volcanoes all at once. What happens? Why? How long does the effect last? Does it depend on how many volcanoes you use? Remove all human activity (i.e. GHG emissions drop to zero instantly). How long does it take for the greenhouse gases to return to the levels they were at before the industrial revolution? Why? Change the tilt of the earth’s axis a bit. What happens to seasonal variability? Why? Can you induce an ice age? If so, why? Move the earth a little closer to the sun. What happens to temperatures? How long do they take to stabilize? Why that long? Burn all the remaining (estimated) reserves of fossil fuels all at once. What happens to temperatures? Sea levels? Polar ice? Set up the earth as it was in the last ice age. How much colder are global temperatures? How much colder are the poles? Why the difference? How much colder is it where you live? Melt all the ice at the poles (by whatever means you can). What happens to the coastlines near where you live? Over the rest of your continent? Which country loses the most land area? Keep CO2 levels constant at the level they were at in 1900, and run a century-long simulation. What happens to temperatures? Now try keeping aerosols constant at 1900 levels instead. What happens? How do these two results compare to what actually happened? Now compare your answers with what the rest of the class got. And discuss what we’ve learned. [And finally, for the advanced students – look at the model software code, and point to the bits that are responsible for each outcome… Okay, I’m just kidding about that bit. We’d need literate code for that]. Okay, this seems like a worthwhile project. We’d need to wrap a desktop-runnable model in a simple user interface with the appropriate switches and dials. But is there any model out there that would come anywhere close to being useable in a classroom situation for this kind of exercise? Justyna sent me a pointer to another group of people exploring an interesting challenge for computing and software technology: The Crisis Mappers Net. I think I can characterize this as another form of collective intelligence, harnessed to mobile networks and visual analytics, to provide rapid response to humanitarian emergencies. And of course, after listening to George Monbiot in the debate last night, I’m convinced that over the coming decades, the crises to be tackled will increasingly be climate related (forest fires, floods, droughts, extreme weather events, etc). and of course, wheels, so he can be pushed around to different workspaces. Now, the first question I had was: could this solve our problem of allowing remote participants to join in a hands-on workshop at a conference? At the last workshop on software research and climate change, we had the great idea that remote participants could appear on a laptop via skype, and be carried around between breakout sessions by a local buddy. Of course, skype wasn’t up to the job, and our remote participants ended up having their own mini-workshop. I suspect the wireless internet at most conferences won’t handle this either – the connections tend to get swamped. But I still think the idea has legs (well, not literally!). See, $4000 is about what it would cost in total travel budget to send someone to Cape Town for the next ICSE. If we can buy much of the kit we need to create a lightweight version of the ESP prototype locally in Cape Town, and use a laptop for the monitor, we could even throw away much of the kit at the end of the conference and still come in under the typical travel budget (not that we would throw it away though!). I think the biggest challenges will be getting a reliable enough internet connection (we’ll probably need to set up our own routers), and figuring out how to mount the kit onto some local furniture for some degree of portability. Well, if we’re serious about finding solutions to climate change, we have to explore ideas like this. PS Via this book (thx, Greg) I learned the word “detravelization”. No idea if the chapter on detravelization is any good (because Safari books online doesn’t work at UofT), but I’m clearly going to have a love-hate relationship with a word that’s simultaneously hideous and perfectly apt. I’ve finally managed to post the results of our workshop on Software Research and Climate Change, held at Onward/Oopsla last month. We did lots of brainstorming, and attempted to cluster the ideas, as you can see in the photos of our sticky notes. Power aware computing (better management of power in all devices from mobile to massive installations). Green controllers (smart software to optimize and balance power consumption in everything that consumes power). Sustainability as a first class requirement in software system design. My personal opinion is that (1) is getting to be a crowded field, which is great, but will only yield up to about 15% of the 100% reduction in carbon emissions we’re aiming for. (2) is has been mapped out as part of several initiatives in the UK and US on eScience, but there’s still a huge amount to be done. (3) is pretty much a green field (no pun intended) at the moment. It’s this third area that fascinates me the most.